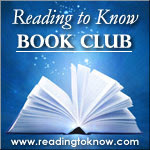 During the month of March we're reading Pilgrim's Progress as part of the Reading to Know 2012 Bookclub. I'm reading the full version in the Old English and am just about at the end of it. I hadn't exactly planned on introducing the story to Bookworm1 (age 5) this year but reading Shonya's post got me thinking about when might be an appropriate time to do so. Then I had a little "epiphany" of my own, if you will, and it made me want to introduce my children to this Christian classic sooner, rather than later. I haven't had any problems reading it but I'm also quite familiar with the story. I do recall my mom reading this to us when we were younger - but I have no idea which version she read from. I also recall watching a video (cartoon?) of the story as well. The storyline is not foreign to me, although some of the words Bunyon used to write his tale might be. I'm not really a fan of using adaptations with children, generally speaking. (In fact, this is the first time I've done so.) Instead of using an adaptation, I'd just as soon hold the book back from them until they are at an age where they can appreciate it in all of its glory. (Because hello!? Anne of Green Gables should NEVER be adapted! There is no justification for this.) I had thought the same of Pilgrim's Progress but then I noticed several people saying that the idea of reading a story in Old English was kinda scary (and I certainly can understand and see why!) and is giving them pause. Again, I totally understand that and I'm absolutely NOT writing this post to offend anyone at all! It just got me to thinking about how the read is going well for me and that is due in great part to the fact that I'm already familiar with the story - even though I haven't been exposed to it in over a dozen years. I began to think that maybe a children's version of Pilgrim's Progress was in order - so that my own children can be familiar enough with it that when they are a bit older, they won't be put off by Old English, but will embrace the story as originally written as an old friend. To wit - I purchased the following book. I searched around a bit online and found a copy of Piligrim's Progress retold by Tim Dowley. I choose this one over Little Pilgrim's Progress: From John Bunyan's Classic because, after looking through the book with Amazon's "Search Inside" feature, I thought the Dowley version followed the text better and presented the story in a way in which my five year old could understand. (If you click on the Amazon link and search inside this version, they kindly provided several pages for you to browse through. More so than usual, I think, which helped me to get a pretty good feel for the read. Much appreciated!) The comments on the Amazon page were also thought-provoking to me as the first comment professes that the original work is intimidating. I really don't think this classic should be so intimidating to us, as readers. Steve Smallman provides the illustrations for the Dowley version of Piligrim's Progress and while they did not appeal to me at first glance, in the end I thought them admirably done. Smallman really sets the scenes well and Bookworm1's emotions were swayed in part by the contrast of lightness and dark which Smallman uses in a masterful way. When the character of Christian is with Faithful, for example, the page is cheery and bright. However, whenever Christian gets off the straight and narrow path or when he finds himself in trouble, Smallman chose to use blacks and grays to illustrate the scene. At first I had a hard time convincing Bookworm1 that he would want to read this story. (I had to bribe him. He was rather hoping we'd read another installment of The Lighthouse Family instead.) However, once we sat down and started reading the book, he didn't want to stop. We read it straight through - from cover to cover! It took about an hour of our time. (Daddy was playing trains with Bookworm2 and had an eye out for baby.) Every time I suggested we take a break he would say, "No, keep reading." The "chapters" of this book (if you can call them that) are quite short. Every two pages or so the story "breaks" and a title is given for the next portion of Christian's adventure. "The Valley of Breaking" is certainly the most challenging one for sensitive readers. This is, of course, when Christian battles Apollyon. Apollyon really is quite a formidable looking beast and I certainly think Smallman had a reason to make him so. However, the first page of this battle scene shows Apollyon fiercely baring down on Christian and the entire page spread makes it look as if Apollyon is stalking the reader. (And so he is, if you think about it.) I suggested to Bookworm1 that he might want to look away as I read this particular page and he took me up on that offer. He remained riveted to the story though and when I turned the page we see Apollyon with a sword in his heart. He is looking up to the sky, roaring in agony and spewing fire. It is not a pretty scene but since he is being defeated, Bookworm1 could handle it. (Shonya included a picture of this scene in her post if you want to hop over and see what I'm talking about.) The only other page spread that bothered him was the scene showing The Giant of Dispair in bed with his extraordinarily ugly and scary wife. They are not pretty people. I wondered if all of the talk of the Giants encouraging Christian and Hopeful to kill themselves would bother Bookworm1, but it did not seem to. He also didn't mind looking at the page of the Giant having fallen to the ground in a fit. The ugliest person was the Giant's wife, but again I think there's good reason to make her quite hideous. Other than those two intense page spreads, the rest of the book was quite manageable. Since we completed reading the book, Bookworm1 keeps asking to look through the pages himself. I haven't let him do so though because when he asks me to look at the pages, I can tell he's half hopeful I'll say no. He is working on being brave enough to stare at Apollyon but I don't think he's there quite yet. So I'm holding it back except if we read it together. At least for the moment. I do think it's important to be discerning when we read or hand over books to our children. We want them to mature into great books. I think Pilgrim's Progress in its original form is something that one should be eager to mature into and I'm very interested in preparing my children for it. I am glad for the adaptation in this case because I think it will make this Christian classic less terrifying of a "project" to tackle later on. Also, I think there is much that Bookworm1 can learn from this allegory even now. In reading it we talked about the burden of sin, the mercy of the cross, the help of the Holy Spirit, and our assured victory in Christ. I knew he was "getting it" and that he was engaged with the story. He was tense and his face was periodically red as I would approach intense parts. Everytime I paused he'd whisper, "Keep reading." It was intense but I believe it was impacting in a positive way and the book handled things in a tasteful way for children. 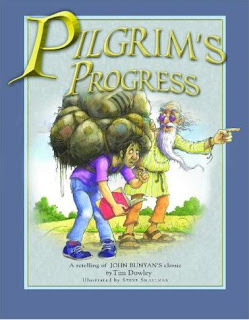 If you think the time is right to introduce your kids to Pilgrim's Progress, I heartily recommend the Dowley version. Thanks, Shonya, for spurring me on there! Oh, this is great, Carrie! I read a novelized adaptation as a kid (& I still have my copy) and thought about reading it to my girls but was undecided. Maybe I will now! Oh, this does sound fabulous. My problems with the original version is not so much the language but in some of the annoying little things...like how the dialogue is noted, but it is not consistent. @Annette - HA! ;D Well, I make an exception for this because it's Old English. I'm quite, quite excited about sharing Anne with my daughter but I would rather talk her up myself and then share The Real Deal with her one day. Anticipation! Thanks for the review -- I'm very curious about this version now! I also read them a children's version of 'Hinds' Feet on High Places,' and I thought it was a necessary corrective to the severity of the PP vision. The two balanced each other nicely. My girl is definitely anticipating Anne! :) We did watch the movie together...actually two. :) Yours will be over the moon when she finally can read it! Running outside for the mail...without coats then nap time...I hope. I too am partial to the original version, but I like archaic stuff in general. Part of the fun of reading is escaping into a different time and place, and the language is as much a part of the experience as the descriptions. I really like that children's version too, obviously, and I liked the illustrations a lot! My little ones simply love it--they choose it as a read aloud at least once a week and they won't accept me only reading part of it either (we have to read the whole stinkin' thing, lol). There aren't many books that I introduce in an abridged format, but the *STORY* of PP is what I want my kids to know, so I don't as much care about them reading the "original version". shrug, I know, people may disagree with me, but I'm not so terribly impressed with the original writing as I am with the parallels he draws. What a neat idea! I never heard of this book. Sounds great. I had never heard of the Little Pilgrim's Progress before either...sounds interesting! I didn't read the original until I was in college! 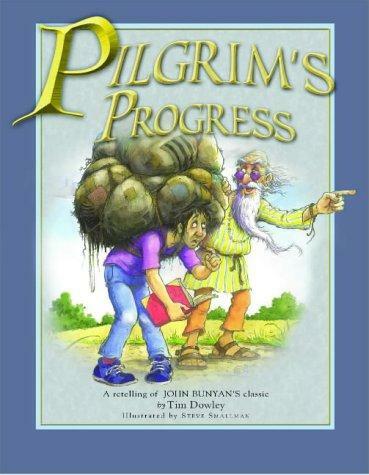 We have read a children's version of Pilgrim's Progress, and have LOVED it! The kids were captivated! I had them draw a picture from each section to make sure they were getting it. We also listened to the full audio in amplified Old English on a road trip - from HARK entertainment (vozar.com) - and it was great for us as parents, but the kids enjoyed it also. VIsiting from Read Aloud Thursday! How did I forget about Pilgrim's Progress this month?! Time is getting away from me this year!! ack! My husband read our modern version aloud with our oldest a year or two ago. It was difficult but they persevered. Do you know that I am still reading Pilgrim's Progress?